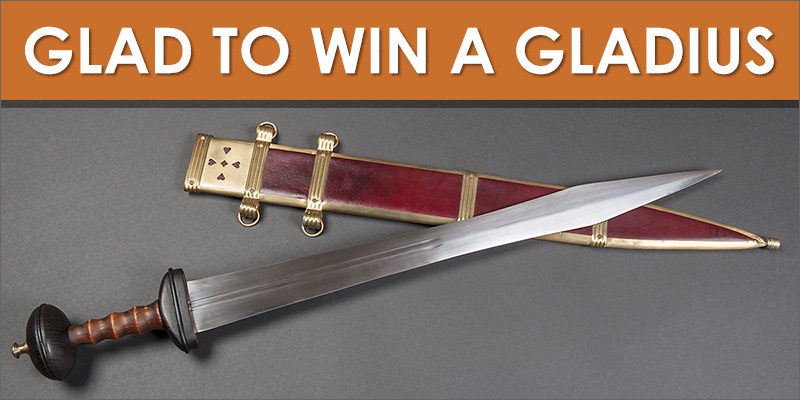 Posted: Wed 04 Nov, 2015 12:01 am Post subject: Contest: Glad to Win a Gladius! Glad to Win a Gladius! Each year for the last several years has seen a member-initiated donation drive intended to pay the big annual cost to host this site. This year's drive ended a couple months ago and successfully paid off that hosting bill. This contest is an acknowledgement to those who contributed. Thanks goes out to all those who donated, purchased membership plans, or helped get the word out to encourage others to do the same. You guys took the burden off my shoulders alone and I certainly appreciate it. Over the years, a bunch of prizes have been given out, but this is the first time we've given away a gladius. I'm glad to be able to give it away and I hope the winner will be glad to win it! I bought this this prize with what I had left of the contribution money, but a thanks must go out to Patrick Kelly for giving me a deal on it. The Signature Edition Actium Gladius has a blade made of 1060 carbon steel. The hilt is made of dark stained wood. This example has been modified from the standard offering in that the white paint and varnish has been removed from the grip. Linseed oil was applied to make for a much more pleasing look. 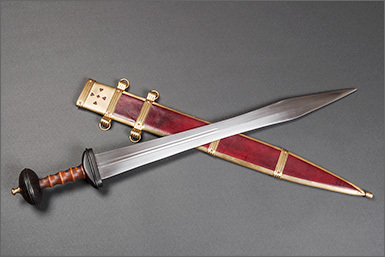 The matching scabbard is wood-cored with a leather exterior and brass accents. A leather baldric is also included. 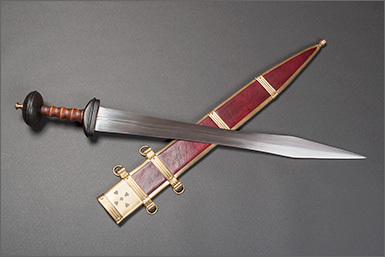 This gladius was designed by Angus Trim and Christian Fletcher and licensed and produced by Valiant Armoury. Overall length: 32.375"; Blade length: 25.1"; Weight: 2.3 pounds; Grip length: 3.75"
If the button says you can click it to enter, that's all you have to do. If it says something else, you can click it for further info. Make sure you're logged-in before you try to enter. You must be a registered member of myArmoury.com and have donated $10 US or more within 90 days of the contest's start date or be a current member of the Benefactors, Upgraded Members, or Premier Members usergroups. All donations made after Aug 6, 2015 are considered. Please note that anonymous donations cannot be counted. If you're not eligible for the contest, you can click the button above for further details. Please see our myArmoury.com Membership Plans to subscribe to a usergroup or our Donation Page. When the contest closes, the names of all the participants will be thrown into a hat. Every $10 contributed as part of a donation or as the cost of a membership plan will earn that participants a separate chance to win. This means that members who donated $10 to the site will have one (1) chance to win. Members who donated $50 to the site will have five (5) chances to win. Members who donated $100 to the site will have ten (10) chances to win... and so on. The more donated, the better the odds of winning the prize! Entrants must be made prior to contest close on Monday Dec 14, 2015 at Midnight PST. All participants will be entered into a drawing and the winning names will be randomly selected later that same day. As of posting this contest, only 94 members are eligible. These are great odds so don't forget to enter! Who knows? You might win. And by all means, don't forget to enter our other contest, too! Everyone is eligible for that one. Have you joined this contest yet? Aren't you curious what your chances of winning are? Remember, your odds to win will change as more people enter the contest. Keep checking back to see your updated chances..
A really nice prize I would certainly enjoy winning it, but contrary to my best selfish interests I encourage all eligible people to join the contest, even if it reduced my odds of winning ....... what would be the fun if it's too easy. I already won a prize some years back and I would feel " ALMOST GUILTY " winning again if eligible people didn't participate. I'm certainly going to check on my odds of winning often, what about you ? . oh, I have joined for sure! A very nice prize indeed! Glad to see the lights still on. I can't spend as much time as I'd like, but I'm glad to continue to support this community. Thanks for the opportunity to check in from time to time. Nice touch with the "view your chances" button Nathan. My chances were 0, until I realized my membership had lapsed. Now they're looking pretty good at this point, but I'd prefer if they weren't. Thanks to everyone who is eligible for this contest. That means that you've contributed to the site and that's more important to me now than ever. Thank you for that. There's still a lot of you who are eligible but have not entered. Why not? You might win a sword. Contributing does not automatically enter you into the contest. This isn't too alarming because not everyone wants to win the prize... but some of you probably do and just haven't remembered to actually enter the contest. This is your reminder. This contest entry period is over. The winner has been announced!